So far this year, the weather has been pretty good and the deep sea fishing has been getting better every day in Orange Beach, Alabama. With cold water on the bottom, the bite on some days has been especially challenging. We have to soak the bait a little longer on some spots, but the rewards are priceless. That is because the trigger fish have been biting pretty good. We are catching trigger fish and having so much fun with them after we get them to the surface and our customers are asking us, “what kind of fish is that?” We take a few minutes to demonstrate how the main dorsal fin will not relax and fall unless you press the trigger fin, located directly behind it. Trigger fish have to be 14″ at the fork length to keep them and are very tasty. The bag limit is going to two per person soon. Right now, the season should be open until about mid May, but that is dependent on how many are caught this spring. 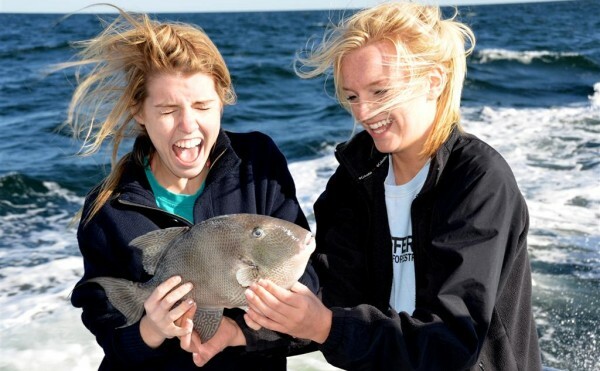 Come fishing with us and let us show you how amazing these fish really are and how much fun they are to catch.